Water is one of the easiest (and cheapest) things to provide to attract animals to your backyard habitat. And it is the most important. It is useful in attracting birds, butterflies, mammals and other animals. To decide what to add: Assess what you have and what will best for your mini-nature preserve. The photograph above shows the most popular saucer in my backyard. I have found that ground level naturalistic features are visited the most in my backyard habitat. This inexpensive plastic saucer has a couple of rocks as landing platforms. The white device in the photo is a “wiggler”. This device is powered by 2 “D” batteries. It has a little piece that hangs down and vibrates. This piece sends ripples across the saucer, just like a real pond. This movement attracts birds. A steady drip does the same thing. 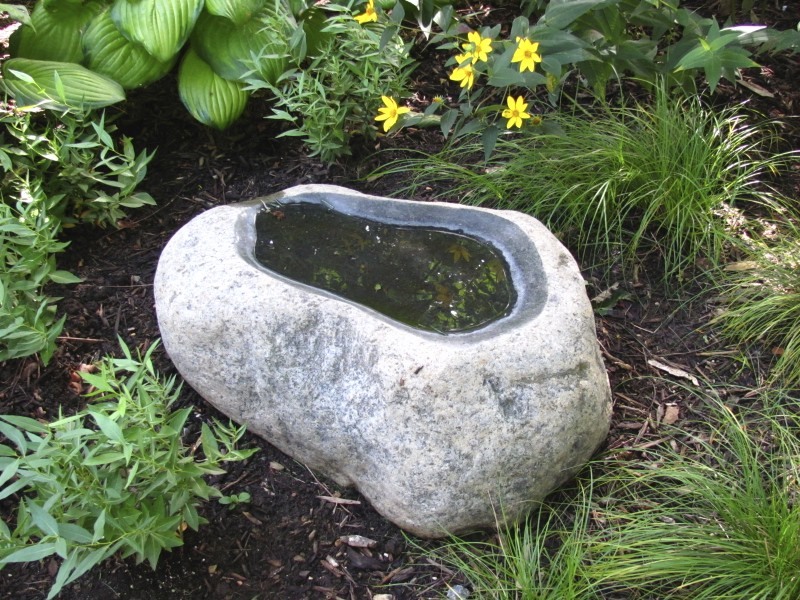 If you have a natural source such as a stream or pond that attracts the animals you want, count yourself lucky. If you would like create a backyard pond or wetland. These PDFs will help you. Gear your Water Resource to the Animals that Visit Your Backyard Habitat. by plants and has a fence behind it that the birds perch on and survey the area before dropping down to drink. the dishes or ponds. For small birds, a bird bath shouldn’t be deeper than 3 inches. gather at puddles, and sip up minerals. You can place damp mud or sand in a saucer to provide for them. on their nightly rounds. I don’t mind because they are not a problem in my backyard. Feral cats also visit the dishes, particularly at night. The cats are not a problem because the birds are sleep in their roosts when they visit. Creating a backyard nature habitat requires acceptance of all creatures, if you are to keep your sanity. I have hanging bird bath but the small ground pool, draws more visitors. I guess because animals don’t find natural streams and ponds suspended in mid-air, like the bird baths we sometimes buy. I use a plant saucer during the summer. Adding water to your habitat is easy, inexpensive and quickly done. It can help you get started right away. Nice article~ I want to add that bees enjoy water sources and need landing spots, too. Thanks for reminding us that bees need landing spots, too.